Although the Hammer's fallen since I began scribblin' this, last and final call; SOLD! Perhaps Y'all haven't heard 'bout a few of the ex-Beatles automobiles going up for auction lately. Jumping back Onstage, ironically another legendous Aston Martin with what the Auctioneers; Err Collectors like to denote as provenance... 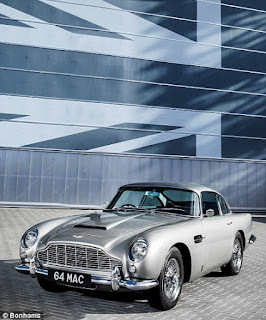 Naturally the current owner of said famed Aston wanted to get the Led; Err Greenback outta Thar investment El Pronto! Whilst all of this DB5 talk made me recall that 007's legendary Aston Martin had gone under the Hammer some seven years ago, netting a whopping Quadruple million sale price! James Bond's Gadget-filled Aston Martin Sold! Holy Houses of Aston Martins Batman, Indeed! As naturally, my very quick and not overly too scientific search upon Al Gore's invention, thou Internetz' claimed two different production figures, albeit both being extremely low. As we'll just say that less than 1,100 total examples were made, in two primary versions, i.e. ; Coupe & Convertible. While there were an ultra rare 13 Shooting Brake versions built, along with an ultra low number of DB5 Vantages produced! As here's the Oh, So Clever wrap upon Sir Paul's DB5 being sold! As somebody give me a Cheeseburger; Thank you, Thank you very mucho; Oh Never Mind!